For quantities more that one bucket please call for a shipping qote. 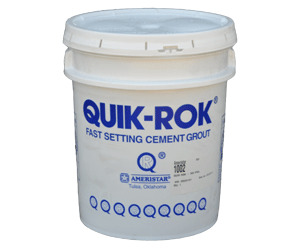 QUIK-ROK® is supplied in 52.5 lb. pails. is less than 2 hole diameters from the outside perimeter of the hole. Water used in mixing QUIK-ROK® must be as pure as possible; if it is drinkable, it is probably suitable. water-to-QUIK-ROK® ratio is maintained. Variations in the ratio will affect absorption and strength over time. for every 10 lbs. of cement in the mix. Stir thoroughly adding as little water as is necessary for flow. LEAST 3 TIMES DIAMETER OF POST, in most cases.